backspace The ::backspace signal is a keybinding signal which gets emitted when the user asks for it. cut-clipboard The ::cut-clipboard signal is a keybinding signal which gets emitted to cut the selection to the clipboard. delete-from-cursor The ::delete-from-cursor signal is a keybinding signal which gets emitted when the user initiates a text deletion. extend-selection The ::extend-selection signal is emitted when the selection needs to be extended at location . insert-at-cursor The ::insert-at-cursor signal is a keybinding signal which gets emitted when the user initiates the insertion of a fixed string at the cursor. insert-emoji The ::insert-emoji signal is a keybinding signal which gets emitted to present the Emoji chooser for the text_view . move-viewport The ::move-viewport signal is a keybinding signal which can be bound to key combinations to allow the user to move the viewport, i.e. paste-clipboard The ::paste-clipboard signal is a keybinding signal which gets emitted to paste the contents of the clipboard into the text view. populate-popup The ::populate-popup signal gets emitted before showing the context menu of the text view. preedit-changed If an input method is used, the typed text will not immediately be committed to the buffer. select-all The ::select-all signal is a keybinding signal which gets emitted to select or unselect the complete contents of the text view. set-anchor The ::set-anchor signal is a keybinding signal which gets emitted when the user initiates setting the “anchor” mark. toggle-cursor-visible The ::toggle-cursor-visible signal is a keybinding signal which gets emitted to toggle the Gtk.TextView :cursor-visible property. toggle-overwrite The ::toggle-overwrite signal is a keybinding signal which gets emitted to toggle the overwrite mode of the text view. Gtk.TextView has a main css node with name textview and style class .view, and subnodes for each of the border windows, and the main text area, with names border and text, respectively. The border nodes each get one of the style classes .left, .right, .top or .bottom. Creates a new Gtk.TextView. If you don’t call Gtk.TextView.set_buffer() before using the text view, an empty default buffer will be created for you. Get the buffer with Gtk.TextView.get_buffer(). If you want to specify your own buffer, consider Gtk.TextView.new_with_buffer(). Creates a new Gtk.TextView widget displaying the buffer buffer . One buffer can be shared among many widgets. buffer may be None to create a default buffer, in which case this function is equivalent to Gtk.TextView.new(). The text view adds its own reference count to the buffer; it does not take over an existing reference. Adds a child at fixed coordinates in one of the text widget’s windows. The window must have nonzero size (see Gtk.TextView.set_border_window_size()). Note that the child coordinates are given relative to scrolling. When placing a child in Gtk.TextWindowType.WIDGET, scrolling is irrelevant, the child floats above all scrollable areas. But when placing a child in one of the scrollable windows (border windows or text window) it will move with the scrolling as needed. Moves the given iter backward by one display (wrapped) line. A display line is different from a paragraph. Paragraphs are separated by newlines or other paragraph separator characters. xlib.Display lines are created by line-wrapping a paragraph. If wrapping is turned off, display lines and paragraphs will be the same. xlib.Display lines are divided differently for each view, since they depend on the view’s width; paragraphs are the same in all views, since they depend on the contents of the Gtk.TextBuffer. Moves the given iter backward to the next display line start. A display line is different from a paragraph. Paragraphs are separated by newlines or other paragraph separator characters. xlib.Display lines are created by line-wrapping a paragraph. If wrapping is turned off, display lines and paragraphs will be the same. xlib.Display lines are divided differently for each view, since they depend on the view’s width; paragraphs are the same in all views, since they depend on the contents of the Gtk.TextBuffer. Converts coordinate ( buffer_x , buffer_y ) to coordinates for the window win , and stores the result in ( window_x , window_y ). Note that you can’t convert coordinates for a nonexisting window (see Gtk.TextView.set_border_window_size()). Moves the given iter forward by one display (wrapped) line. A display line is different from a paragraph. Paragraphs are separated by newlines or other paragraph separator characters. xlib.Display lines are created by line-wrapping a paragraph. If wrapping is turned off, display lines and paragraphs will be the same. xlib.Display lines are divided differently for each view, since they depend on the view’s width; paragraphs are the same in all views, since they depend on the contents of the Gtk.TextBuffer. Moves the given iter forward to the next display line end. A display line is different from a paragraph. Paragraphs are separated by newlines or other paragraph separator characters. xlib.Display lines are created by line-wrapping a paragraph. If wrapping is turned off, display lines and paragraphs will be the same. xlib.Display lines are divided differently for each view, since they depend on the view’s width; paragraphs are the same in all views, since they depend on the contents of the Gtk.TextBuffer. Returns whether pressing the Tab key inserts a tab characters. Gtk.TextView.set_accepts_tab(). Gets the width of the specified border window. See Gtk.TextView.set_border_window_size(). Gets the bottom margin for text in the self . Returns the Gtk.TextBuffer being displayed by this text view. The reference count on the buffer is not incremented; the caller of this function won’t own a new reference. If iter is None, the actual cursor position is used. The rectangle position is in buffer coordinates; use Gtk.TextView.buffer_to_window_coords() to convert these coordinates to coordinates for one of the windows in the text view. Obtains a copy of the default text attributes. These are the attributes used for text unless a tag overrides them. You’d typically pass the default attributes in to Gtk.TextIter.get_attributes() in order to get the attributes in effect at a given text position. The return value is a copy owned by the caller of this function, and should be freed with Gtk.TextAttributes.unref(). Returns the default editability of the Gtk.TextView. Tags in the buffer may override this setting for some ranges of text. Gets the default indentation of paragraphs in self . Tags in the view’s buffer may override the default. The indentation may be negative. Gets the value of the Gtk.TextView :input-hints property. Gets the value of the Gtk.TextView :input-purpose property. Retrieves the iterator at buffer coordinates x and y . Buffer coordinates are coordinates for the entire buffer, not just the currently-displayed portion. If you have coordinates from an event, you have to convert those to buffer coordinates with Gtk.TextView.window_to_buffer_coords(). if non-None, location to store an integer indicating where in the grapheme the user clicked. It will either be zero, or the number of characters in the grapheme. 0 represents the trailing edge of the grapheme. Retrieves the iterator pointing to the character at buffer coordinates x and y . Buffer coordinates are coordinates for the entire buffer, not just the currently-displayed portion. If you have coordinates from an event, you have to convert those to buffer coordinates with Gtk.TextView.window_to_buffer_coords(). Note that this is different from Gtk.TextView.get_iter_at_location(), which returns cursor locations, i.e. positions between characters. Gets a rectangle which roughly contains the character at iter . The rectangle position is in buffer coordinates; use Gtk.TextView.buffer_to_window_coords() to convert these coordinates to coordinates for one of the windows in the text view. Gets the default justification of paragraphs in self . Tags in the buffer may override the default. Gets the default left margin size of paragraphs in the self . Tags in the buffer may override the default. Gets the Gtk.TextIter at the start of the line containing the coordinate y . y is in buffer coordinates, convert from window coordinates with Gtk.TextView.window_to_buffer_coords(). If non-None, line_top will be filled with the coordinate of the top edge of the line. Gets the y coordinate of the top of the line containing iter , and the height of the line. The coordinate is a buffer coordinate; convert to window coordinates with Gtk.TextView.buffer_to_window_coords(). Gets the value of the Gtk.TextView :monospace property. whether self is in overwrite mode or not. Returns whether the Gtk.TextView is in overwrite mode or not. Gets the default number of pixels to put above paragraphs. 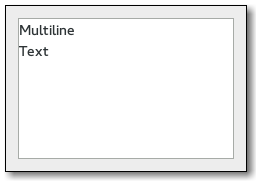 Adding this function with Gtk.TextView.get_pixels_below_lines() is equal to the line space between each paragraph. Gets the value set by Gtk.TextView.set_pixels_below_lines(). The line space is the sum of the value returned by this function and the value returned by Gtk.TextView.get_pixels_above_lines(). Gets the value set by Gtk.TextView.set_pixels_inside_wrap(). Gets the default right margin for text in self . Tags in the buffer may override the default. copy of default tab array, or None if “standard” tabs are used; must be freed with Pango.TabArray.free(). Gets the default tabs for self . Tags in the buffer may override the defaults. The returned array will be None if “standard” (8-space) tabs are used. Free the return value with Pango.TabArray.free(). Gets the top margin for text in the self . Fills visible_rect with the currently-visible region of the buffer, in buffer coordinates. Convert to window coordinates with Gtk.TextView.buffer_to_window_coords(). Retrieves the Gdk.Window corresponding to an area of the text view; possible windows include the overall widget window, child windows on the left, right, top, bottom, and the window that displays the text buffer. Windows are None and nonexistent if their width or height is 0, and are nonexistent before the widget has been realized. If you connect to an event signal on self , this function should be called on event->window to see which window it was. Allow the Gtk.TextView input method to internally handle key press and release events. If this function returns True, then no further processing should be done for this key event. See Gtk.IMContext.filter_keypress(). Note that you are expected to call this function from your handler when overriding key event handling. This is needed in the case when you need to insert your own key handling between the input method and the default key event handling of the Gtk.TextView. Updates the position of a child, as for Gtk.TextView.add_child_in_window(). Moves a mark within the buffer so that it’s located within the currently-visible text area. Ensures that the cursor is shown (i.e. not in an ‘off’ blink interval) and resets the time that it will stay blinking (or visible, in case blinking is disabled). This function should be called in response to user input (e.g. from derived classes that override the textview’s Gtk.Widget ::key-press-event handler). Scrolls self the minimum distance such that mark is contained within the visible area of the widget. Scrolls self so that iter is on the screen in the position indicated by xalign and yalign . An alignment of 0.0 indicates left or top, 1.0 indicates right or bottom, 0.5 means center. If use_align is False, the text scrolls the minimal distance to get the mark onscreen, possibly not scrolling at all. The effective screen for purposes of this function is reduced by a margin of size within_margin . Note that this function uses the currently-computed height of the lines in the text buffer. Line heights are computed in an idle handler; so this function may not have the desired effect if it’s called before the height computations. To avoid oddness, consider using Gtk.TextView.scroll_to_mark() which saves a point to be scrolled to after line validation. Scrolls self so that mark is on the screen in the position indicated by xalign and yalign . An alignment of 0.0 indicates left or top, 1.0 indicates right or bottom, 0.5 means center. If use_align is False, the text scrolls the minimal distance to get the mark onscreen, possibly not scrolling at all. The effective screen for purposes of this function is reduced by a margin of size within_margin . accepts_tab (bool) – True if pressing the Tab key should insert a tab character, False, if pressing the Tab key should move the keyboard focus. Sets the width of Gtk.TextWindowType.LEFT or Gtk.TextWindowType.RIGHT, or the height of Gtk.TextWindowType.TOP or Gtk.TextWindowType.BOTTOM. Automatically destroys the corresponding window if the size is set to 0, and creates the window if the size is set to non-zero. This function can only be used for the “border windows”, and it won’t work with Gtk.TextWindowType.WIDGET, Gtk.TextWindowType.TEXT, or Gtk.TextWindowType.PRIVATE. Sets the bottom margin for text in self . Sets buffer as the buffer being displayed by self . The previous buffer displayed by the text view is unreferenced, and a reference is added to buffer . If you owned a reference to buffer before passing it to this function, you must remove that reference yourself; Gtk.TextView will not “adopt” it. Note that this property may be overridden by the Gtk.Settings :gtk-keynave-use-caret settings. Sets the default editability of the Gtk.TextView. You can override this default setting with tags in the buffer, using the “editable” attribute of tags. Sets the default indentation for paragraphs in self . Tags in the buffer may override the default. Sets the Gtk.TextView :input-hints property, which allows input methods to fine-tune their behaviour. Sets the Gtk.TextView :input-purpose property which can be used by on-screen keyboards and other input methods to adjust their behaviour. Sets the default justification of text in self . Tags in the view’s buffer may override the default. Sets the default left margin for text in self . Tags in the buffer may override the default. Sets the Gtk.TextView :monospace property, which indicates that the text view should use monospace fonts. Changes the Gtk.TextView overwrite mode. Sets the default number of blank pixels above paragraphs in self . Tags in the buffer for self may override the defaults. Sets the default number of pixels of blank space to put below paragraphs in self . May be overridden by tags applied to self ’s buffer. Sets the default number of pixels of blank space to leave between display/wrapped lines within a paragraph. May be overridden by tags in self ’s buffer. Sets the default tab stops for paragraphs in self . Tags in the buffer may override the default. Sets the top margin for text in self . Determines whether iter is at the start of a display line. See Gtk.TextView.forward_display_line() for an explanation of display lines vs. paragraphs. Converts coordinates on the window identified by win to buffer coordinates, storing the result in ( buffer_x ,`buffer_y`). If the type is Gtk.DeleteType.CHARS, GTK+ deletes the selection if there is one, otherwise it deletes the requested number of characters. Gdk.EVENT_STOP to stop other handlers from being invoked for the event. Gdk.EVENT_PROPAGATE to propagate the event further. If you need to add items to the context menu, connect to this signal and append your items to the popup , which will be a Gtk.Menu in this case. If Gtk.TextView :populate-all is True, this signal will also be emitted to populate touch popups. In this case, popup will be a different container, e.g. a Gtk.Toolbar. The signal handler should not make assumptions about the type of widget , but check whether popup is a Gtk.Menu or Gtk.Toolbar or another kind of container. The ::set-anchor signal is a keybinding signal which gets emitted when the user initiates setting the “anchor” mark. The “anchor” mark gets placed at the same position as the “insert” mark. The ::toggle-cursor-visible signal is a keybinding signal which gets emitted to toggle the Gtk.TextView :cursor-visible property. Don’t confuse this property with Gtk.Widget :margin-bottom. Which IM (input method) module should be used for this text_view. See Gtk.IMContext. Setting this to a non-None value overrides the system-wide IM module setting. See the Gtk.Settings Gtk.Settings :gtk-im-module property. Additional hints (beyond Gtk.TextView :input-purpose) that allow input methods to fine-tune their behaviour. Don’t confuse this property with Gtk.Widget :margin-left. If :populate-all is True, the Gtk.TextView ::populate-popup signal is also emitted for touch popups. Don’t confuse this property with Gtk.Widget :margin-right. Don’t confuse this property with Gtk.Widget :margin-top.